Today, onePULSE Foundation announced it will hold an open two-stage international competition to design the new National Pulse Memorial & Museum in Orlando, Florida. Architects from around the world are encouraged to submit their qualifications by 3 p.m. EST on April 30, 2019. In collaboration with Dovetail Design Strategists, one of the country’s leading independent selection firms, the Foundation will pick six studios and their proposed teams by late May to create concept designs for the overall project, which will sit on the site of the PULSE nightclub and nearby properties. 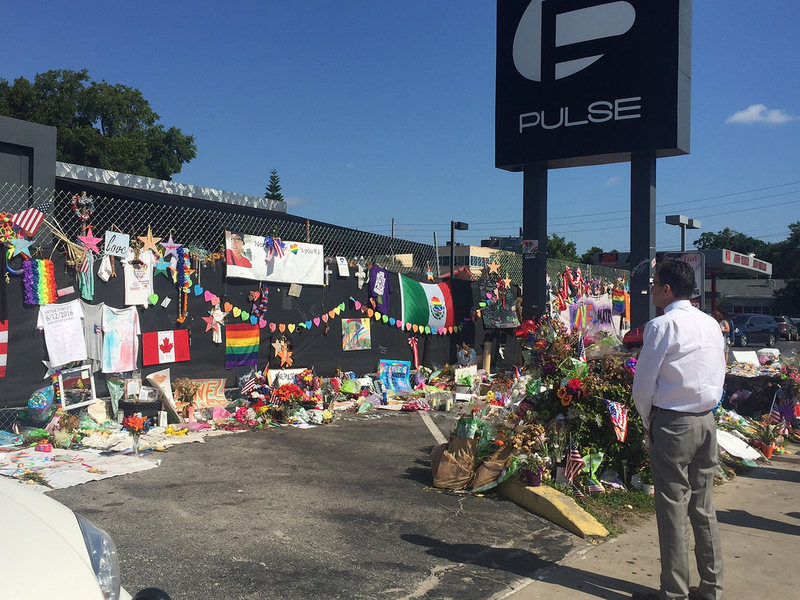 The original building, in which 49 members of Orlando’s LGBTQ community were killed in an early morning shooting on June 12, 2016, will be incorporated into the new memorial masterplan. Per the competition website, the “focus of the memorial will be the victims, survivors, and first responders, not the tragic event.” For Stage II of the competition, entrants will be challenged to reimagine the sacred site with a sprawling landscape and comprehensive urban design that honors the lives that were lost, while simultaneously bringing hope and joy to visitors and the families of the victims. 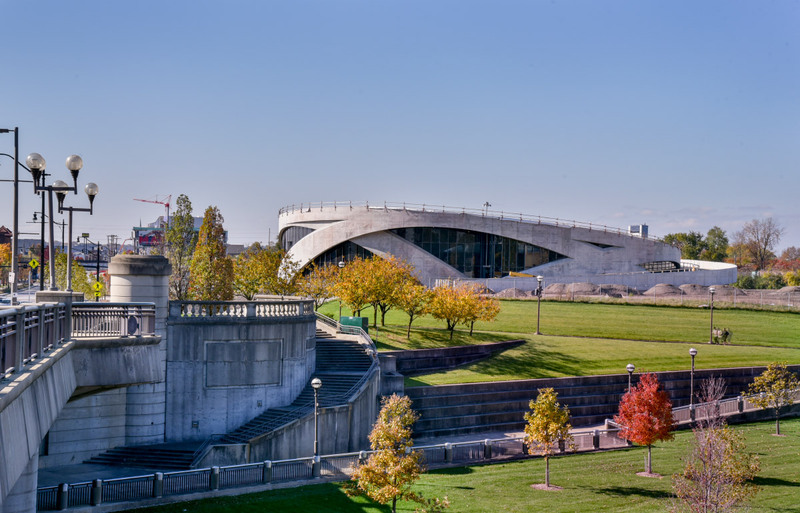 The site will feature a new, 30,000-square-foot, “architecturally iconic” museum that will educate and address issues of tolerance, diversity, and inclusion. Outdoor space for community gathering and performances will also be woven into the new construction. An integral part of the site’s extension will be the pedestrian pathway known as Survivors' Walk. It will trace the three-block journey many victims and survivors took to the nearby Orlando Regional Medical Center that fateful summer night. The Walk will additionally stretch further north to the Dr. Phillips Center for the Performing Arts, where the first community vigil was held for the tragedy three years ago. According to the Foundation, this link will further deepen the site’s connection to downtown. The six shortlisted firms will be selected by a jury of onePULSE Foundation leadership, local Orlando stakeholders, and architects Laurind H. Spear, co-founder of Arquitectonica and principal of Arquitectonica GEO, Sarah Whiting of WW Architecture, and Yolanda Daniels of studioSUMO. This September, the top concepts will be showcased at a public exhibition at the Orange County Regional Historic Center in Orlando, Florida. After a public commentary period and presentations to the jury, the winning team will be announced in late October. Each team will receive a $50,000 honorarium for meeting the Stage II requirements of the competition once the final design is chosen. The new National Pulse Memorial & Museum is slated to cost $45 million and expected to open in 2022. The memorial site will be free and open to the public year-round, seven-days-a-week, 24-hours-a-day. For more information on submitting, visit the onePULSE competition website. 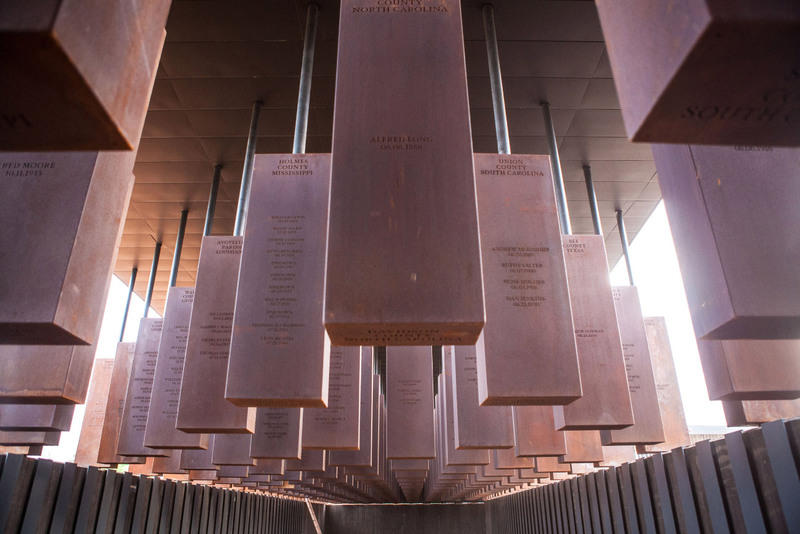 On April 26, the National Memorial for Peace and Justice, the first memorial in the U.S. dedicated to African American victims of lynching and continued discrimination, will open to the public in Montgomery, Alabama. The memorial, designed by Boston-based MASS Design Group, will open in tandem alongside The Legacy Museum: From Enslavement to Mass Incarceration, also located in Montgomery, which will chart the history of African American segregation from slavery to the present day. Both projects stem from the Equal Justice Initiative (EJI), a nonprofit group that works to right racial injustices, advocates for those in racially or economically segregated communities, and provides legal representation for the illegally arrested or abused. The memorial itself, located in the middle of six acres of hilltop in Montgomery, is a square-shaped, open-air pavilion dedicated to the more than 4,400 victims of lynching in America. Their names are inscribed across over 800 six-foot-tall, rectangular columns wrapped in Corten steel and hung from the ceiling of the memorial. Each of the columns represents a county where the lynchings listed took place, and replicas of each are located outside of the pavilion for their respective counties to come and claim; the columns left behind are meant to be a public reminder of which county has failed to engage with the memorial. Visitors just outside of the pavilion’s entrance will be confronted by a sculpture from Ghanian artist Kwame Akoto-Bamfo of a mother in chains, crying out while cradling a baby under her arm. A sculpture by Dana King dedicated to the women who kept the Montgomery Bus Boycott alive will also be located near the “town square” memorial. “Our nation’s history of racial injustice casts a shadow across the American landscape,” said EJI Director Bryan Stevenson. “This shadow cannot be lifted until we shine the light of truth on the destructive violence that shaped our nation, traumatized people of color, and compromised our commitment to the rule of law and to equal justice.” ﻿ The Legacy Museum is only a 15-minute walk from the memorial, and the two-story, 11,000-square-foot brick building sits on a site that had historically been used to warehouse slaves. Inside, the museum will use videos, photography, and research materials to introduce visitors to first-hand accounts of the domestic slave trade. From there, sculptures from Titus Kaphar and Sanford Biggers, among other mixed-media works and photographs, will paint a portrait of life under enforced segregation in the Jim Crow South. Through a range of mediums including animation and paintings, the museum hopes to create a full timeline of racial segregation in America. According to the EJI, design and artistic partners for the museum also include Local Projects, Tim Lewis and TALA, Molly Crabapple, Orchid Création, Stink Studios, Human Pictures, HBO, and Google. The April 26 opening ceremony will be followed by several days of panels, presentations, and concerts at the museum. The Allied Works Architecture-designed National Veterans Memorial & Museum (NVMM) is rapidly rising on the shore of the Scioto River in downtown Columbus, Ohio, and is on track to open in July 2018. 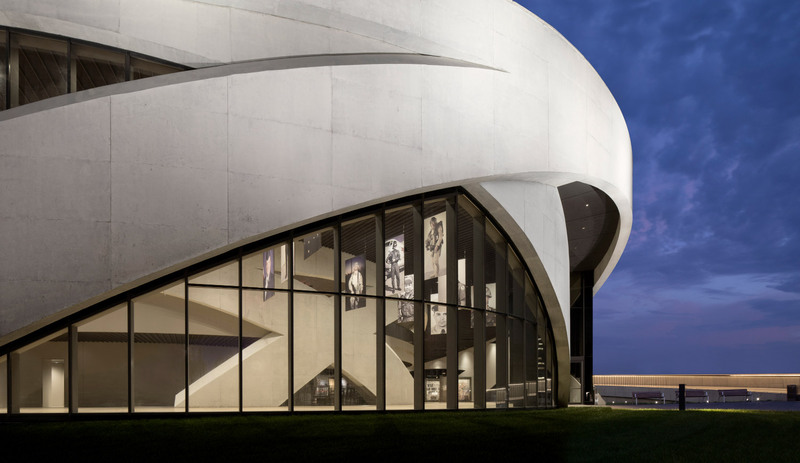 Allied Works’s design for the two-story, 53,000-square-foot memorial museum, a circular building with a glass curtain wall ensconced in a spiraling concrete superstructure, is the result of a closed 2013 design competition that included David Chipperfield and Diller Scofidio + Renfro. 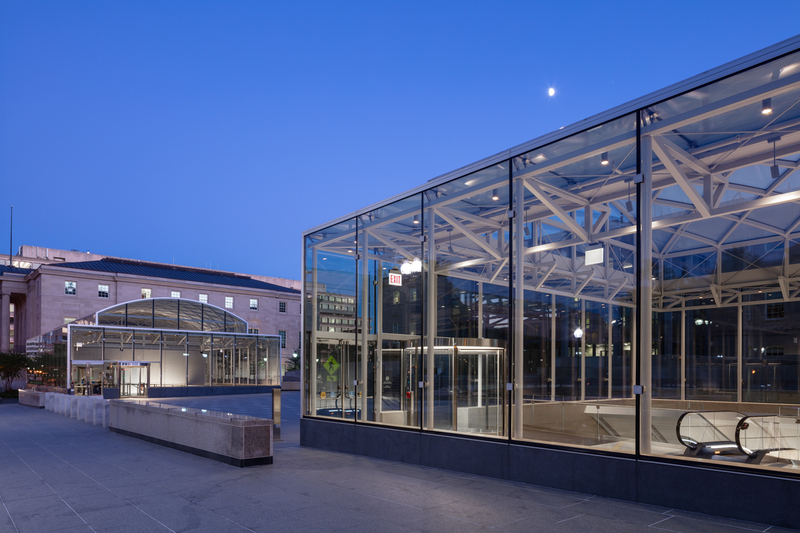 The winning scheme includes a ramp that wraps around the edge of the building and up to a rooftop “sanctuary” plaza, while large concrete arches crisscrosses the museum’s exterior to symbolically elevate the sanctuary. The sanctuary will be exclusively for ceremonies, events, and reflection, and from renderings, it looks like the rooftop plaza will include amphitheater seating and look out into museum’s exhibition space. Inside, the museum’s programming will similarly follow the building’s curves, with exhibition galleries arranged in a ring. A double-height great hall will greet visitors at the entrance, while two floors of permanent exhibition space will be arranged in a central ring and provide access to the sanctuary from inside. “Thematic alcoves” will be scattered throughout the museum, each meant to evoke a specific emotion and relay the challenges faced by veterans. Landscape architect OLIN will be handling the surrounding greenery and have designed a memorial grove in the middle of a circular path near the museum. The grove will also contain a stone wall with a reflecting pool at the base. The museum’s development, design, and construction were led by the Columbus Downtown Development Corporation (CDDC). The group is also managing the exhibition curation, as well as raising approximately $80 million for the project. The NVMM, which claims to be the first national veterans museum, has set its sights on being part museum and part memorial, with veteran narratives being placed front and center. With only 1 percent of the population currently serving in the military, the museum's mission is to expose guests, who may not personally know a veteran, to the stories of servicemen and women, while also stimulating conversations around what it means to serve. While originally planned as the Ohio Veteran’s Museum, the scope was drastically expanded to include the stories of veterans from across the country, and from every branch and conflict. In November 2017, the House passed a bill officially designating the museum a national site, capping a years-long push by the NVMM for federal recognition. With our office just two blocks up from Ground Zero, we are feeling the exhilaration and pride right up to our 5th floor windows. And when we saw NBC’s Matt Lauer at the corner Starbucks preparing for a ‘live from’ segment, we didn’t hesitate to buttonhole the guy and give him our latest timely issue—online today!—featuring a complete rundown on the Memorial Museum, along with some first views of the underground construction site that is taking shape as a museum as large as almost any in the city—with the potency of history. 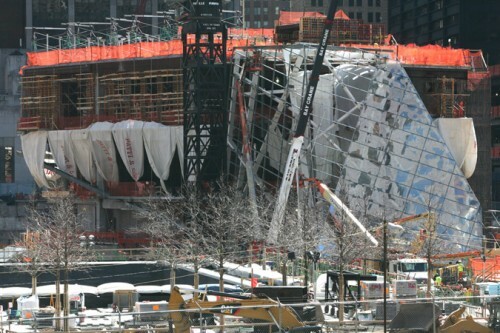 It's been a couple of weeks since we stopped by the WTC site. The most striking aspect from the street remains the speed with which glass surfaces begin to rise. 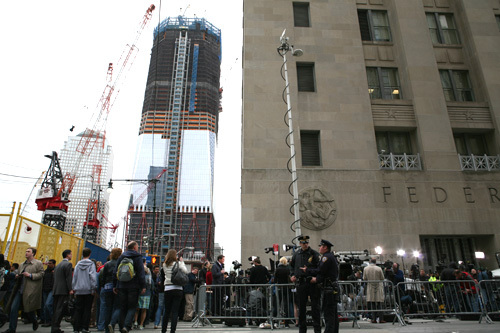 It seems like only yesterday that three stories of glass wrapped around Tower One. Now with ten stories completed, the quartz-like surfaces start to take shape. At the Memorial Museum, Snohetta's glass has flown up in what seems a matter of days. The facade already reflects the grove, whose trees continue their own march toward West Street.